I’m on some kind of knitting winning streak at the moment. It turns out that if you put down the jumper knitting for a while and pick up some small projects, finished items arrive pleasingly fast. Look at these! 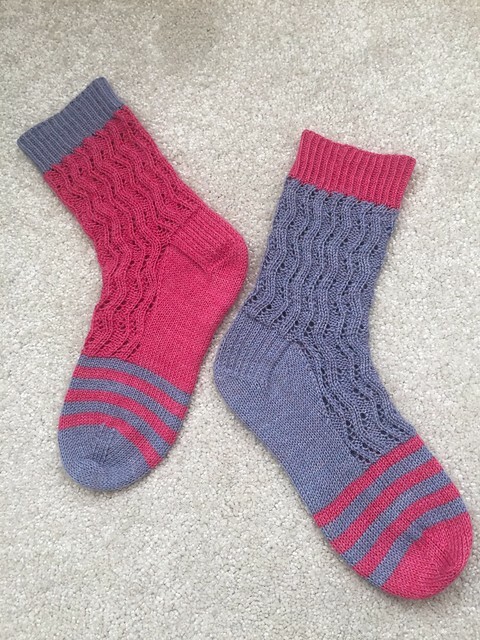 I’ve not made a pair of socks in ages so it felt like time and, given that I’d got everything I needed to make this pair from Yarnporium earlier this month, I found myself powerless to resist casting on. 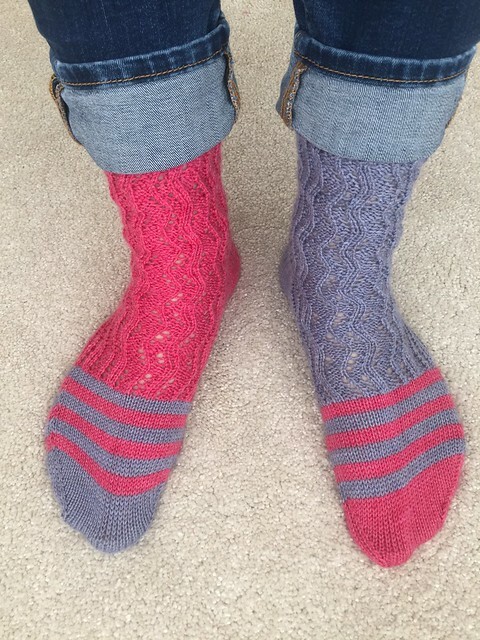 This is a pair of ‘sock 2s’ from Coopknits’ Hortensia pattern. The pattern actually has different lace patterns on each sock but I preferred the motif for sock 2, and the colour alternation (is that a word?) makes them mis-matchy enough for me. 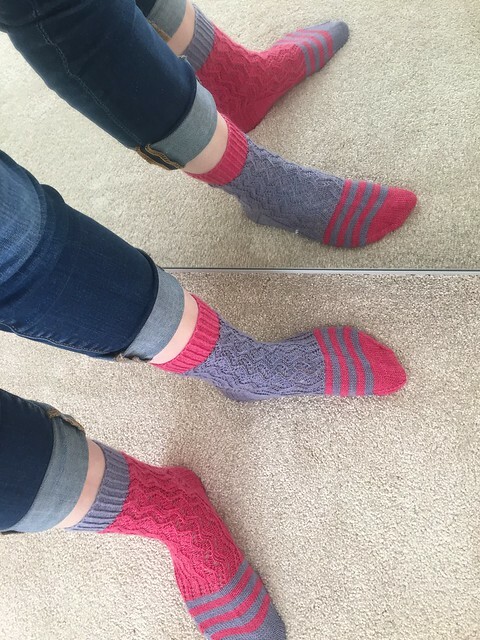 I started the lace pattern halfway through on the second sock to make them mirror-images of each other (apparently I am a tiny bit OCD) and picked up a couple of extra stitches around the heel, but otherwise followed the pattern exactly as written. They’re my first top-down socks in years, and the first time I’ve followed a sock pattern since about 2007. All credit to CoopKnits – these were so much fun to knit and so fast to make (and her yarn is utterly lovely to knit with). There are at least three or four other patterns in this book that I’m longing to make so I’d highly recommend getting your hands on a copy. In fact, I have already cast on for a pair of Linnea socks. I can’t look at them and not smile. 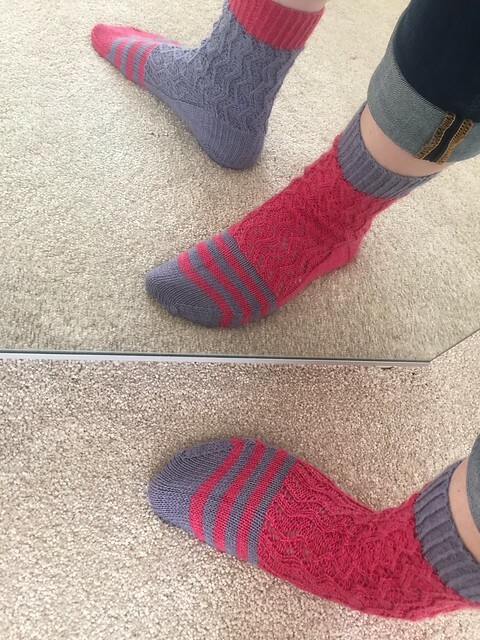 Who doesn’t need a pair of lacy bubblegum stripy socks in their life? Previous Post Sneak peeks and party season! Thank you! Me too, the colour palette for the Socks Yeah yarn is brilliant.